A warm, friendly, typical Malayali home is now open to feeding hungry folk, craving a good old Kerala-style meal. And naturally, there’s a loving Aunty behind this venture. Say hello to God’s Own Cafe. A home away from home, where a Malayali Aunty, with quintessential warmth, has opened the doors of her house, literally, to get the flavor of backwaters and all things Kerala. The menu is flexible, so there’s something new on it everyday! All foodies, vegetarians and non-vegetarians alike will love the authentic flavours of Kerala as served lovingly by an Uncle and Aunty from God’s own country. The place is absolutely no frills, so don’t go expecting a swanky setting. It’s like visiting a friends house simply because you love the food that his or her mother cooks! It has a slightly rustic setting with basic furniture but once the food arrives you are transported directly to the lush environs of Kerala. They usually serve a nice welcome drink that just sets the tone for the meal that’s going to follow. 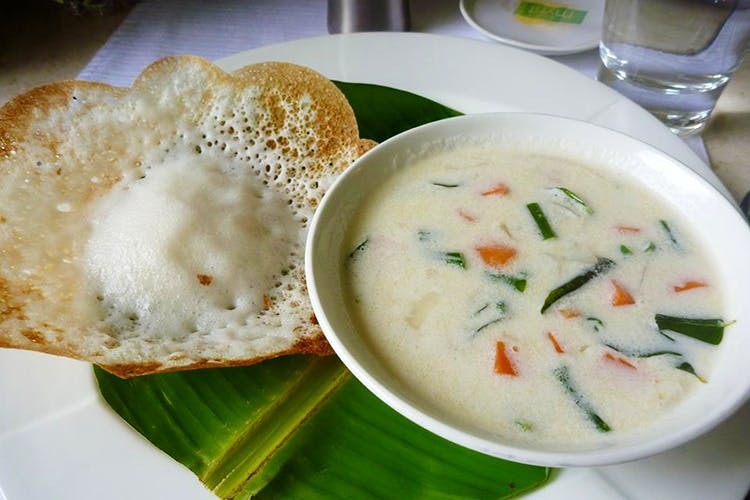 The appams are a sure shot thing to try, a perfect balance between sweet and crispy. Also, try the ghee roast with the choice of fresh seafood or chicken. The vegetarian meals are less spicy than the regular dishes and the famous Matti fry is a fresh accompaniment. I loved the food more than anything else. The menu is limited and changes every day. Do ask for the spice levels while ordering and ask for less hot preparations in case your spice tolerance is low. The warmth that this couple shows you while serving you delicious food is another most welcome addition. I would definitely go there for that, and authentic taste from backwaters. Better to book a seat and go, it gets busy for lunch.